White Zombie is set on the Caribbean island of Haiti and follows a young couple, Madeline Short and Neil Parker, played by Madge Bellamy (The Iron Horse) and John Harron (Silk Stockings) respectively who are visiting Charles Beaumont, a friend of Madeline. The film begins with the lovebirds arriving during a traditional Voodoo funeral and several passers-by, an ominous sign of what it to follow from which the coachman flees at a breakneck speed and drops the two at Beaumont’s plantation. Here we meet Beaumont, played by Robert Frazer (The Vampire Bat) with a clear crush on the doe-eyed Madeline. We are also introduced to the local (Christian) priest, Dr Bruner (Joseph Cawthorn, The Great Ziegfeld) who conducts the wedding ceremony between Madeline and Neil. Unfortunately for the newlyweds, Beaumont, desperate to have Madeline for his own, approaches Bela Lugosi’s character, ‘Murder’ Legendre, a voodoo master who possesses a crew of zombies, including the voodoo priest he learnt the dark art from and someone sent to execute him. Legendre and Beaumont ‘kill’ Madeline and turn her into a zombie, sending Neil into a drunken spiral of despair through which he is haunted by the spirit of his lost love. Wracked by grief, he goes to see Dr Bruner who explains his theory about the use of drugs to induce a zombie-like state in a victim and how he suspects this has happened to Madeline. The two then go on a mission to rescue Madeline from Legendre, who has since turned on the poor Beaumont. Understandably the sound and picture quality are poor compared to modern films and some of the scenes skip but that is only to be expected for a film that is over 80 year’s old. Similarly, a film with such blatant racism would not get made nowadays, but in from 1915-1934 Haiti was occupied by the US and an enforced labour regime was employed so it may be somewhat representative of the time the film was made. The scenery was borrowed from other horror films being filmed at the same studio so there is a lack of cohesion on the scenery that is confusing at times. White Zombie is an interesting, little (at just over an hour long) film with a clear story. I like the fact that, unlike a lot of modern films, the film has a resolution (however predictable) and doesn’t leave an obvious opening for a sequel (e.g. Insidious). It is also a slightly different take on the zombie canon, from the common risen dead or the more recent disease infection. 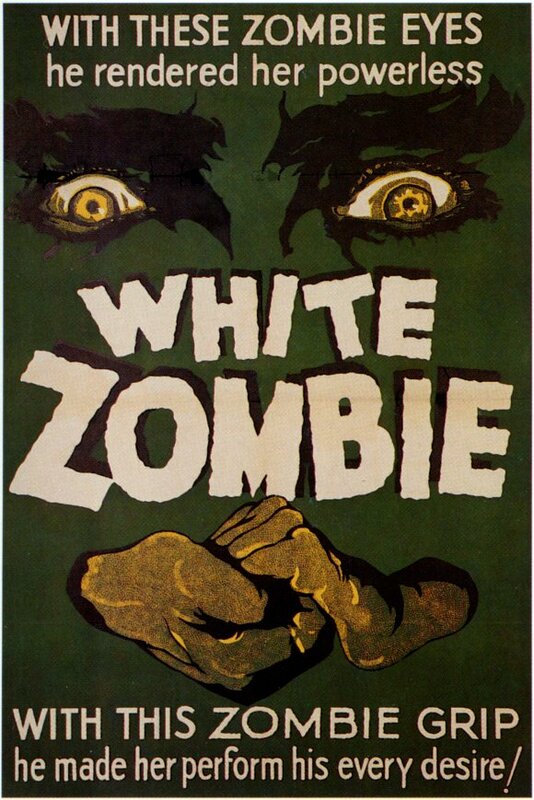 Whilst not scary, I would recommend White Zombie to all horror fans. Fun Fact: Bellamy retired from screen after a scandal in the early 40s in which she shot at her then partner, Albert Stanwood Murphy and filed for divorce, despite never being legally married.